J.R.J. Heating Services Ltd specialises in the installation and maintenance of gas boilers and all aspects of the hot water and central heating system. 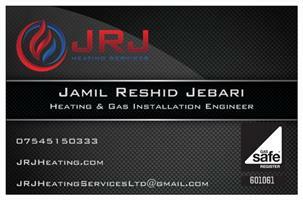 Based in Stanmore and founded by Jamil Jebari, who has over 8 years experience, gained as a direct employee of British Gas. Averaging approximatley 70 - 90 boiler installations and heating upgrades a year for the past 8 years ensures he has the knowledge, experience and ability to deliver a safe and satisfactory service. A huge proportion of the new boilers installed were various models of the Vaillant and Worcester Bosch range. Jamil is also a Vaillant Advanced installer, and can offer extended warranties on their extensive range of high quality boilers. Services are not exclusive to the above list. Please call for information or a qoute on anything not mentioned. **Guaranteed to beat the price of any official quote from a reputable company.